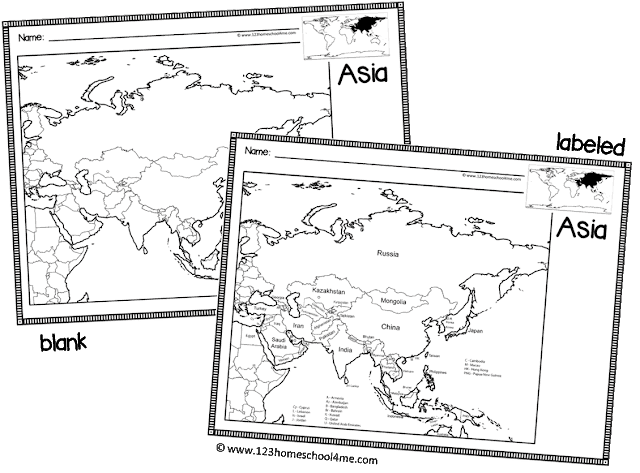 Whether you are learning about geography, countries for kids, or just trying to show your kids the route you are taking on your next vacation, these FREE Printable Blank Maps will come in handy! These FREE Printable Blank Maps are super handy no matter what curriculum, country, or project you are working on. 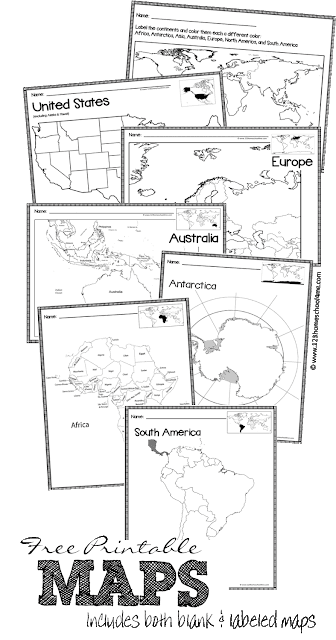 Plus, these world maps are available with labeling or without making them super useful for working learning mountains, rivers, capitals, country names, continents, etc. The blank world map is especially helpful for getting a bird eye view of the world, oceans, continents, major countries, and finding me on the map with kids of all ages from preschool, kindergarten, elementary age, middle school, and even high school students. In the free download below you will find the following map of the world for kids for whatever your individual needs may be. These are great for learning about geography for kids, an in-depth look at a certain region or country, or a more in depth look at Christmas Around the World. OK! I’ve joined 3 times! All I wanted was the MAPS! I homeschool 2 BOYS! I DON’T WANT THE PRINCESS COLORING PAGE! I JUST WANT THE MAPS! I’VE WASTED way TOO MUCH TIME ON YOUR SITE ALREADY. and by the way, in YOUR welcome on YOUR home page the word you wanted was YOU’RE, not YOUR!! I guess I didn’t want you teaching my family anything anyway! Sorry you are having trouble. We have just switched to a new delivery system for our most popular printables so please excuse us as we get the kinks out of our system in providing FREE printables 😉 I just checked and it should email you this directly…. I’ll send it to your email you commented with. Enjoy. I can’t believe you are so rude. This lady is offering you her hard work for FREE! Be grateful, not hateful! Hi, I am wondering if I could get the maps emailed to me. I seem to be having trouble getting it through subscribing. Just send you the instant download link. Just click on the blue button to download them immediately. I just resent the download link. Enjoy!